I'm completely in love with Jaejoong's bachelor pad! I know it's not terribly surprising that a Cassie would love Jaejoongie's apartment, but have you seen that place? Yeah, *scoffs* I haven't seen it in person either, but did you see the spread in Marie Claire magazine? Jae definitely has good taste or a good interior decorator because his apartment is so tastefully furnished. I really fell in love with his Stingray rocking chair! 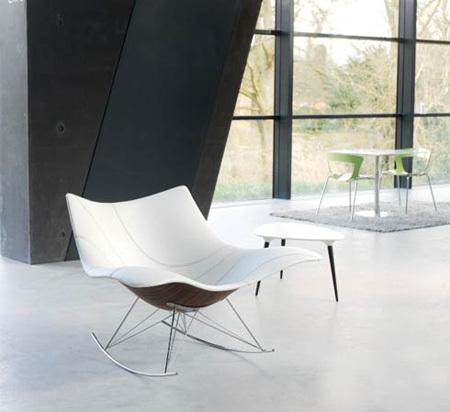 The Stingray rocking chair is an intelligent modern redesign of the classic rocking chair. It gives the apartment a very young modern feel. Even with the huge leather couches around, the room still looks playful and futuristic because of the Stingray. Stingrays are a bit pricey and retail from 2,950GBP or 4,731USD (same as Jae's) to 3,950GBP or 6,335USD (leather and wood version). Can I Get It? Of course you can get it. Decoratum (a vintage/retro furniture store in London) carries both designs. They are guaranteed to get any Jae-lover very excited. Promise. Stingray rocking chair, oak white pigmented lacquer wood & chrome frame with leather neck cushion (Model No 3510 / Series 0410) by Thomas Pedersen, Denmark, 2008. The Danish Design Prize, formerly known as the ID-prize, is Denmark`s highest design honours. With the prize the Danish Design Centre recognises companies and designers who have created product or solutions that demonstrate prize-worthy quality, beauty, innovation or functionality. Stingray is a complex item of furniture that succeeds both functionally and as sculpture. It works in different materials and is surprisingly comfortable to sit in, the jury remarked in choosing Stingray as the winner of the Danish Design Prize. The award is intended to recognise high-quality products boasting new and innovative design. Red Dot is viewed as an imortant seal of approval throughout the world. An independent jury chose Stingray as one of the unique design products in the Product Design category. The highly prestigious award is presented in collaboration with the esteemed German design institute Rat fr Formgebung. It is intended to recognise not only best design at the Cologne International Furniture Fair but also the most innovative product on display. The wooden version of Stingray won this award for "best design", presented by the Danish interior design magazine Bolig Magasinet. The award celebrates a chair that stands out even among the finest works of Danish and international design.